It’s a funny thing when you don’t know much about Indian food; you think of the dishes per color: brown sauce, red sauce, yellow sauce, orange sauce. This might not look too pretty or presentable, but it’s super delicious, and it’s the best version I’ve tried and it’s from Two Sleevers. An immersion blender is necessary here–at the very least, a regular blender because you want the sauce to be smooth before you melt the butter into it. You can trade in the coconut milk with heavy cream if that’s more handy. 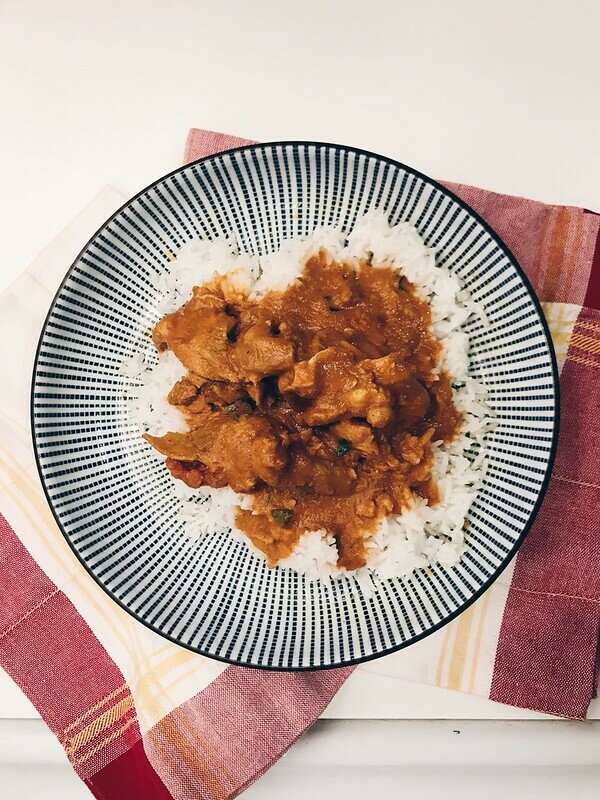 Cook your rice separately with ghee and a little salt and when you’re ready to eat, scoop up the butter chicken sauce all over the rice and top with a few chicken pieces. And hey, sprinkle cilantro liberally for a touch of green color, why don’t you. 1. Combine all the ingredients except the butter, the coconut milk, a tsp of the garam masala, and the cilantro in your Instant Pot. Add the chicken and mix well to cover. 2. Cover and lock the lid properly. Select the Pressure Cook function for 8 minutes. When it’s done, do a quick release after venting and letting the steam out. 3. Remove the chicken and set aside. (Be gentle with your tongs! The meat falls apart!) Using an immersion blender, blend together the sauce until it’s smooth. Let the sauce cool for 5 minutes. Stir in the butter, coconut milk, cilantro, and garam masala, until butter is melted. Remove half the sauce to a container and save for later. Add the chicken back to the remaining sauce, mix gently, and serve with rice.